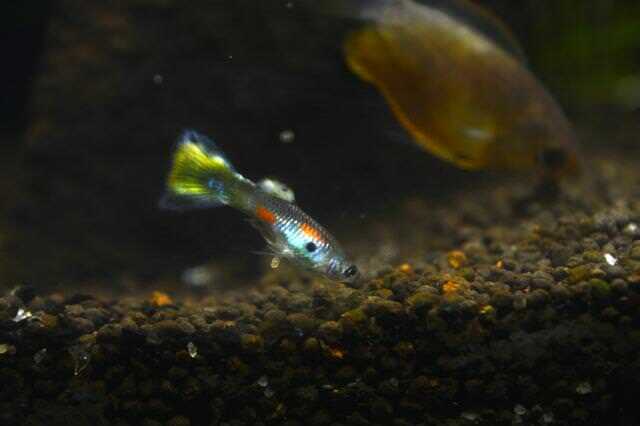 indianaquariumhobbyist.com Forums » Post 357928 » Re: 7G low tech tank Journal. 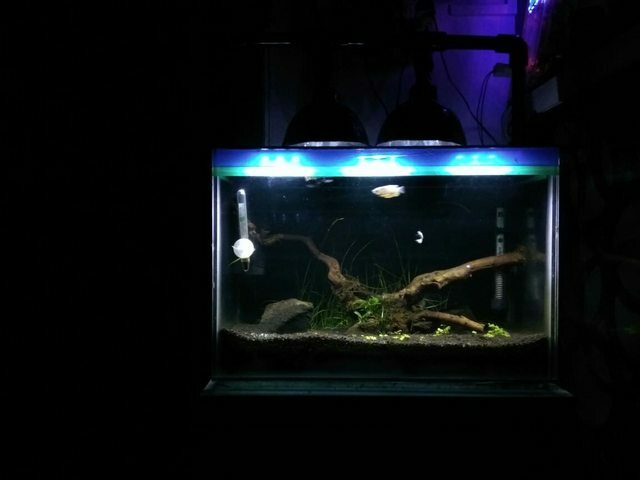 http://indianaquariumhobbyist.com/community/ :: View topic - 7G low tech tank Journal. 7G low tech tank Journal. Posted: Wed Mar 21, 2018 2:12 pm Post subject: 7G low tech tank Journal. I setup a 7G low tech with low light plants in early feb. Its got valisneria, anubias, hydro "Honda" and java moss. I used 18W of 6500k LED lighting, putting about 1800lumens, 4 inch above the water surface and inside aluminum reflectors, which ran for 10-12hrs a day initially. The substrate is a mix of inert coarse sand, clay pellets and contro-soil about 2 inches. Initially there was a huge algal bloom, with all sorts of algae covering everything. I reduced the lighting to 9W, reduced the photoperiod to about 8hrs and started dosing excel in large amounts, 5ml every 2 days. In a week or two, algae had gone away completely. 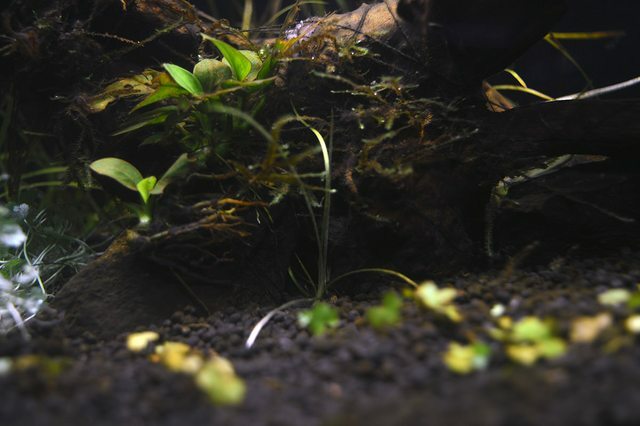 3 weeks had passed till now, most of the java moss had turned brown with only small specks of green in some places, hydrocotyle was growing but very slowly, valisneria plants had almost 40% of their leaves melted, most of the anubias' leaves had wilted as well leaving behind unsightly skeletons. While looking for reasons why my plants were taking a hit, I found out anubias and valisneria both dont do too well with glutaraldehyde(Excel) so I stopped doing that. The plants still didnt seem to recover. I figured maybe the 9W of LED is too less for the plants, but at the same time the full 18W had wrecked havoc in the form of algae.To counter that, I built a timer switch powered by arduino, which keeps the lights on from 8 to 12 in the morning and 4 to 8 in the evening. I ran this setup for 3 days, and there was noticeable improvement in the anubias, and by now the Java moss had been showing good growth in the form of several new fronds as well. The hydrocotyle however, wasnt growing as it was with high excel dosing at the start nor did the valisneria plants stop shedding leaves. Curiously, the valisneria plants seem to be highly prolific with their runners and I can count around 20 new plants coming off of the 15 big individuals I bought, even though the larger, older plants are shedding leaves constantly. 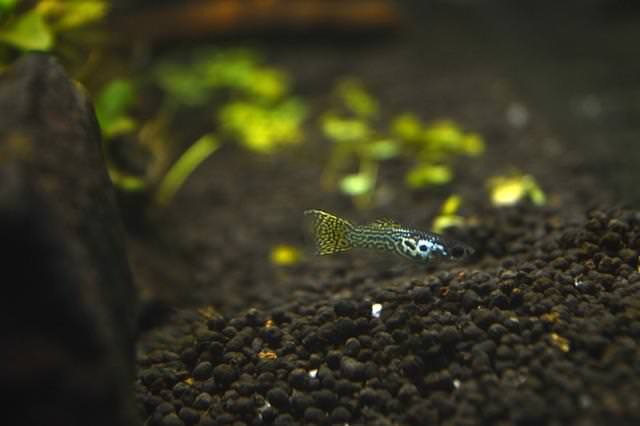 CO2 seemed to be the problem here, I didnt want to get into DIY CO2 again for this so I thought fishes would be the best solution, they would help with fertilizing as well with their poop. I went ahead and bought a pair of honey gouramis and 2 pairs of male guppies. They've been in it for two days at the time of writing this post and they all seem healthy, active and eating well. The tank has HUMONGOUS Swarms of seed shrimp, so I feel the fishes are gonna have the time of their lives! 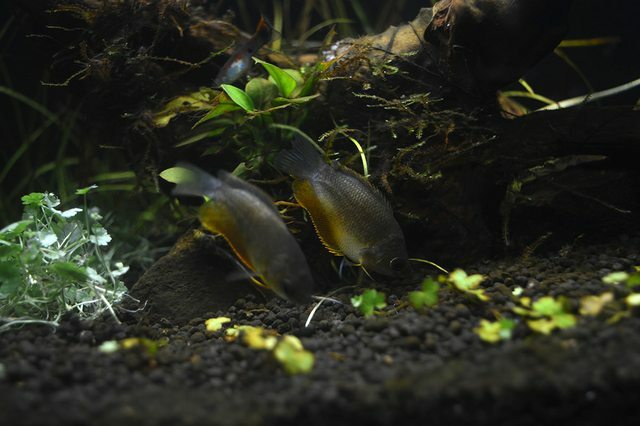 Would the fish with their CO2 and nutritious poop be enough for the vals and hydrocotyle to flourish? Or do I need to increase the bioload of the tank? Is the photoperiod and light good for its inhabitants? Would adding more plants help with the balance of the system somehow? I will update this thread with pictures soon. Posted: Thu Mar 22, 2018 12:06 am Post subject: Re: 7G low tech tank Journal. Posted: Thu Mar 22, 2018 8:56 am Post subject: Re: 7G low tech tank Journal. I have a similar sized planted tank low tech with almost the same specs. I agree 18W with 10-12 hour photo period may be too much. But you have not mentioned your water change schedule. I have a huge bio load as well, I keep 6 adult sized mollies and 4 zebra danios for a really small tank. I brought the tank second hand and replaced the lighting and the filtration, I have a top filter which does a decent job. But I change 40-50% of water every 3-4 days, depending on the filter media soliage. I am dosing excel as well, but no ferts. Plants in the tank are: Hygophilia Corymbosa, Bacopa caroliniana, Bacopa monnieri, Amazon Swords, Echinodorus tenellus, Echinodorus cordifolius. 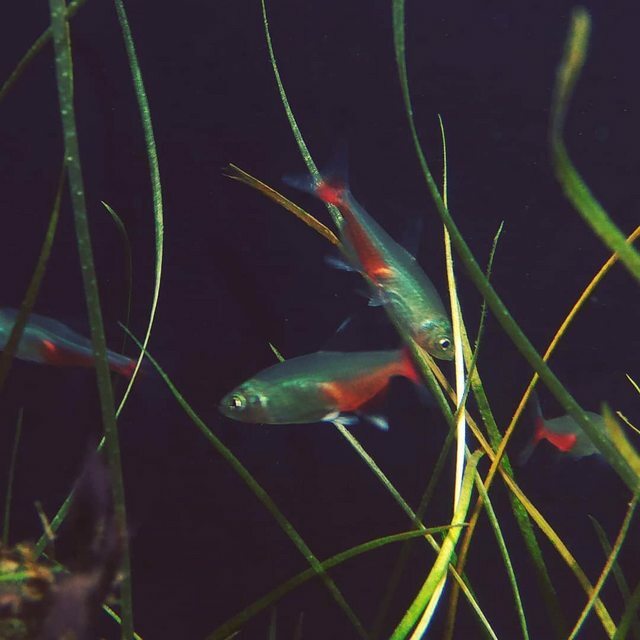 Stem plants love excel and are doing well, the Echinodorus tenellus (pygmy chain swords) are also doing fine. The others are not showing that much interest, neither are they dying as well. Posted: Thu Mar 22, 2018 9:08 am Post subject: Re: 7G low tech tank Journal. The endlers and the gourami look stunning. 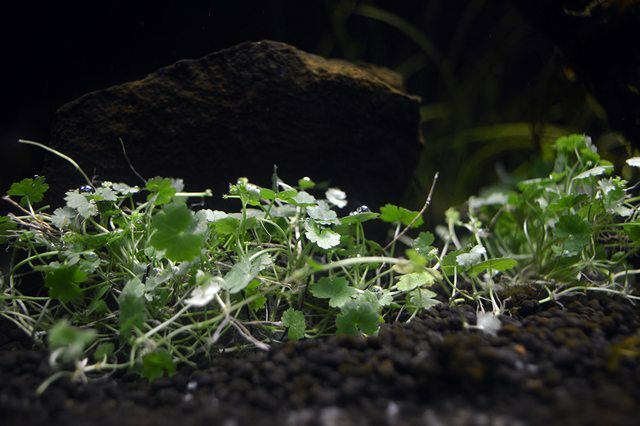 Once the Hydrocotyle Tripartita "Honda" starts shaping up the scape will look stunning. Its an interesting stem plant that needs to be rooted not trimmed. Posted: Thu Mar 22, 2018 1:54 pm Post subject: Re: 7G low tech tank Journal. The endlers and the gourami look stunning. 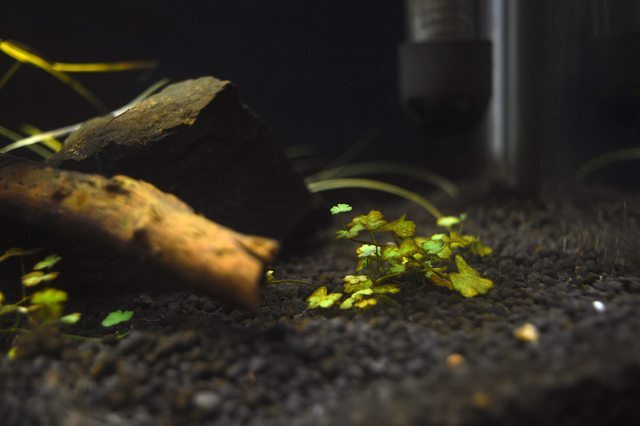 Once the Hydrocotyle Tripartita &quot;Honda&quot; starts shaping up the scape will look stunning. Im loving the hydro! I plan on adding a few more individuals. 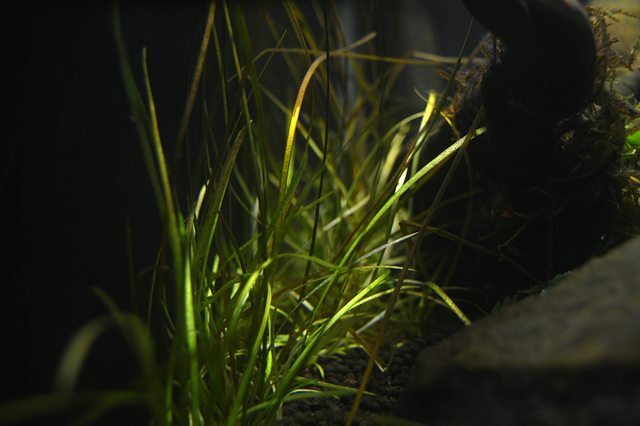 The plant seems to have sprouted new leaves almost overnight once the fishes were added and wattage of the lights was increased. I am sure it'll start growing strong really fast. I am also planning on adding a few more plants. I do 25% WC weekly, and evaporation top-up every 2 days. During the algae bloom, I was doing heavy water changes to compensate to the extra excel. Almost 50% weekly. Posted: Thu Mar 22, 2018 3:07 pm Post subject: Re: 7G low tech tank Journal. Also if you are using internal power filter, consider upgrading to a HOB or if you can make a DIY external filter, even better. The amount of media in regular internal filter is seriously a joke. Only after that you may increase the bio load. But still not recommended owing to small size of tank. Posted: Thu Mar 22, 2018 4:51 pm Post subject: Re: 7G low tech tank Journal. This substrate is more than 5 years old. It had a pretty nice carpet of E.Tenellus and Monte Carlo previously. I had to tear down the tank because I was moving out and since then it was laying idle for 3 years. I dont know how much of it is still nutritious, and looking at the poor condition of my Vals, I think its safe to assume its inert now. I got this filter purely because I dont intend to increase the bioload of this system ever. 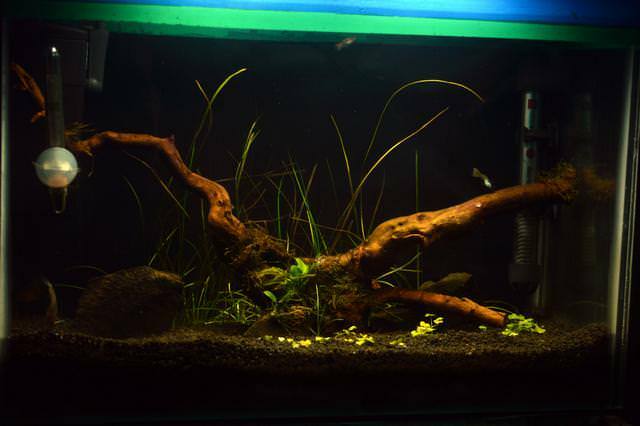 In fact once the plants are stable and growing and I am satisfied with the scape, I'll remove the current fauna and replace with 6x Galaxy Rasboras OR a few cherry shrimp. Regarding CO2, have you tried getting the DIY CO2 kit from amazon? I got it a few years back from aliexpress and it works amazingly well! Posted: Fri Mar 23, 2018 1:38 pm Post subject: Re: 7G low tech tank Journal. The main lights are on only between 8 to 12 in the morning and 4 to 8 in the evening. 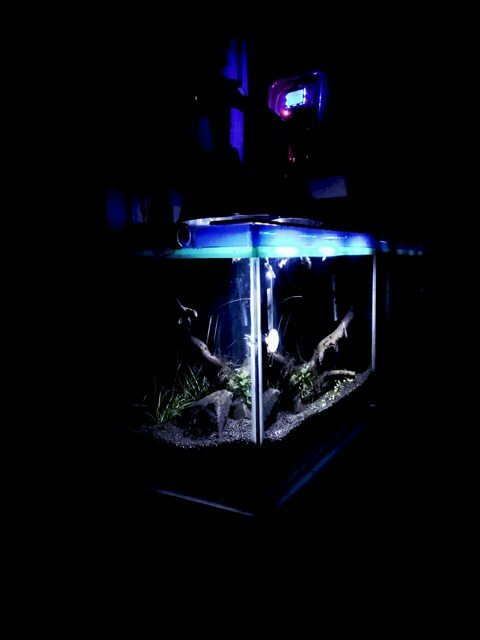 Im home only after 8 at night so I never found the lights on to see the tank when I get home. I had to always pull the plug from the timer, insert it into the mains and then repeat the process again when I was done. To cure that, I added 3W of ambient lights to the setup. These lights are on from 8Am to 10pm. Just while typing this post it has struck me that these lights need to be off when the main lights are on, I'll update the code later tonight lol. Here is a GIF of the timer and ambient lights in action. The lights look much brighter in the gif than what they really are, and in person they are perfect! Posted: Sun Mar 25, 2018 3:04 pm Post subject: Re: 7G low tech tank Journal. There seems to be early stages of diatom bloom. Older Hydrocotyle leaves are getting a bit brown-ish. New ones are bright green. Anubias seems to be shooting new leaves pretty quick since the addition of fish. Even Hydrocotyle is sending out new leaves quick. I am thinking of adding Rotala Nanjenshan, Bacopa Monereri, and some crypt sp. in the coming few weeks. Before that I want to add Hydrocotyle sibthorpioides to the system. H. sibthorpioides because I have a near endless supply of it growing emersed in my garden, I only hope these plants survive in submerged. Posted: Mon Mar 26, 2018 8:48 am Post subject: Re: 7G low tech tank Journal. Posted: Mon Mar 26, 2018 12:53 pm Post subject: Re: 7G low tech tank Journal. Got around to digging a nice 5x5 inch(ish) mat of H. sibthorpioides from my garden. The area these plants live does not get direct sunlight for most part of the year and even during the time it does, it only get its for an hour or so in the morning. Yet these platns have formed a lush carpet in the ground. Motivated by this I decided to try and plant them in the tank. Several websites claim these plants need high light and high co2, at the same time there are plenty of sources which claim that it can live without CO2 as well and under moderate lighting. Right now Ive tied down two approximately 2x2 clumps of the plant to rocks and placed on my substrate. Note how its still sprouting new leaves on multiple branches, and they are bright green. Valisneria seems to be doing some strange trick by becoming a carpet plant. 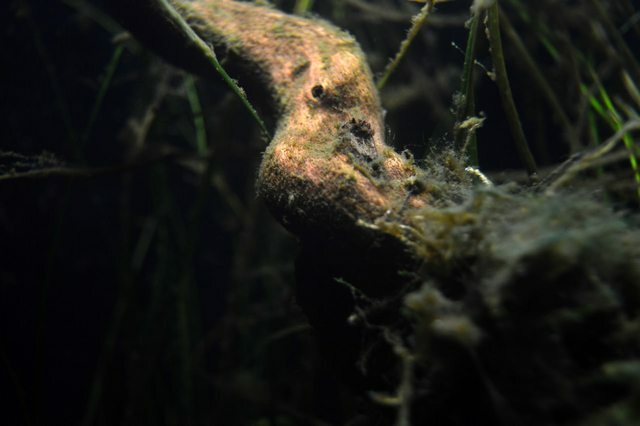 Here you can see it sprouting from underneath the driftwood, its runners traveled from all the way back! but non of the plants is gaining height. This the jungle the plants have created behind the driftwood. I read that excel has done this, however many places claim that if you keep a steady supply of excel going, eventually the plants get used to using it. 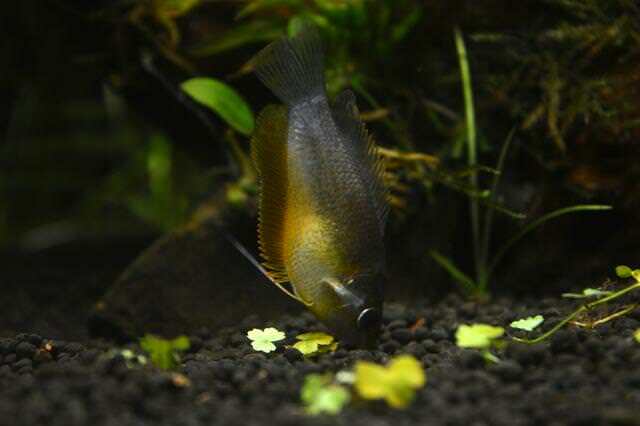 Im hoping for the same, since after stopping excel theres multiple small patches of algae. I am currently doing 1ml every two days. Bonus pic of honey gouramis! Posted: Tue Mar 27, 2018 8:49 am Post subject: Re: 7G low tech tank Journal. @ashwin1224, the picture of Hydrocotyle sibthorpioides that you shared looks very much like Corriander. But jokes apart, these look beautiful. I am sure the algae is under control. Posted: Tue Mar 27, 2018 12:21 pm Post subject: Re: 7G low tech tank Journal. My mother said the same thing! Unsurprising though, since both the plants belong to the same family, Apiaceae. In fact H. sibthorpioides is also used for cooking and has a similar aroma to coriander! It seems the bloom was at its peak when I took those pictures two days ago, today the the leaves appear brighter with only but a slight brown border on the edges. Its too early to say anything about H. sibthorpioides, however the fact that its already growing new leaf buds is encouraging. Posted: Tue Apr 03, 2018 7:14 pm Post subject: Re: 7G low tech tank Journal. While cleaning my room recently, I came across an old DIY CO2 system I had setup a few years ago. Even though I didnt want to get into the mess of it, I just had to set it up because I love doing things like this lol. To my utter surprise the damn thing still worked perfectly! No leaks as far as I can tell in a day of work! Its constantly giving out 1bp/2s. I made a mess-up while setting it up, and accidentally added about 50gms of baking soda directly into the acid mixture, so I think I will have to redo the mixture again in a day or two. Will update the thread with pictures in a week, till then enjoy this gif! Posted: Tue May 08, 2018 5:26 pm Post subject: Re: 7G low tech tank Journal. Small update: Tank is doing great! Hydro Honda has died, and Sibthorpiodes isnt picking up too. But moss and anubias are growing good. Valls seem to be recovering as well. 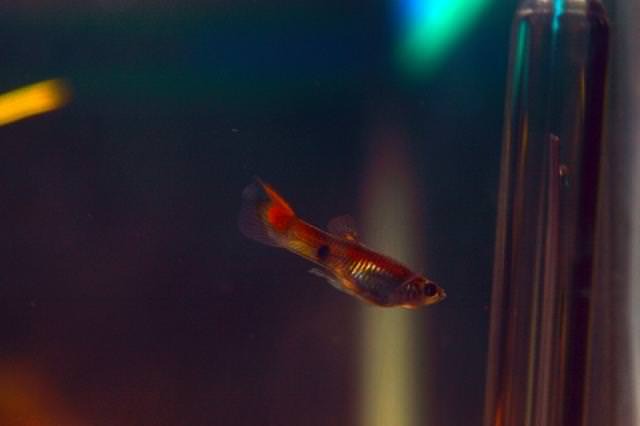 Two of my guppies died for unknown reasons, I suspect they got a disease, they didnt show any symptoms, and other fishes are doing fine even after 3 weeks of their demise.